Recovery Arsenal | Runner. Writer. Renegade. Recovering is as important to our training as the running itself — but we so often convince ourselves that the best thing we can do is more work. But really, the gains are made while you’re resting, not running. You run, you recover, you come back better. Neglect the middle step and you can’t keep stringing those runs together. I’m a huge believer in the recovery process and making sure I am taking care of my body so that I stay uninjured and can achieve my goals. Jasyoga — this is what made me a believer in recovery. It is an online yoga platform, dedicated to yoga for athletes. No fancy sanskrit terms. No fancy equipment. An entire video series is dedicated to 5 minute resets. Other videos target recovering from long runs and high mileage weeks; there are videos for triathletes and running with a jog stroller. There are also videos to help build your mental game or warm-up for a race. Of course, there are videos for strength and flexibility, too. Use code TGRUNFIT for a free month! Regular massage — can’t leave it off the list. I go every three weeks and liken it to getting the oil changed in your car. You can put it off, but eventually it catches up with you. Early in a training cycle, I go ahead and book as far through the block as I can so that I can’t put it off or make an excuse. In the off season, I might go every four weeks instead. I try to get a 30 minute appointment the week of and the week after a marathon that’s more gentle and loosens everything up. Self-massage — really, this column started when my husband bought me another self-massage tool for our anniversary. My collection includes a standard foam roller, a Trigger Point roller, several lacrosse balls, a Roll Recovery R8 and the CTM Band. I try to spend 5-10 minutes a day on self-massage. I keep a lacrosse ball in my bathroom and will roll while waiting for the shower to heat up. The different tools allow me to target different areas — the foam rollers are great for calves and IT bands; the lacrosse ball is great for glutes and hamstrings; the R8 is great for hamstrings and IT bands. Hammer Recoverite — research has shown refueling within 30 minutes of your workout is essential for expediting recovery and maximizing endurance gains. Typically, a 3:1 or 4:1 carbohydrate-to-protein ratio is suggested and there are a number of products on the market. Hammer Nutrition’s Recoverite is my favorite and the reason I switched entirely to Hammer products for my training. The ingredients in Recoverite help strengthen the immune system, rebuild muscle tissue stronger, and store more minutes of readily available fuel (glycogen) in the muscles. It comes in a powder and is easy to mix up post-run with about 8 ounces of water. New to Hammer? Use my name + referral code 254423 on your first online order to save 15% AND get a selection of free samples! Compression socks — these have been popular for a while as athletes knew what the medical profession already knew. In short, by squeezing your lower legs, compression socks and sleeves help get blood back up to your heart. “Compression socks also support the movement of the lymph fluid (from your lymphatic system) that bathes the cells in your body and gives them the support they need to help your body perform at its best,” according to the folks at Comrad socks. Comrad is my current favorite because they make a variety of options that look more like dress socks and are completely work-appropriate. They also fit well — I have bigger calves and smaller feet and long second toes. I also like several products from Zensah, including ones with some additional arch support (great for plantar fasciitis). Epsom salt baths — sometimes you just need to sit back in the tub and not do ANYTHING. You can’t do much in the bathtub. Epsom salt is believed to help soothe sore muscles, plus it is easy and inexpensive! Add 2 cups of Epsom salt to a warm bath and soak for 10-15 minutes — longer if you want! One note here: don’t do an Epsom bath immediately after a hard run or workout. That can increase inflammation in the muscles … unfortunately, right after, an ice bath is the better option. But a few hours or even the next day, an Epsom soak can be a great remedy to relieve achy legs. A great self-care Sunday option. Taking time to recover is a critical piece of training and can be a game-changer. 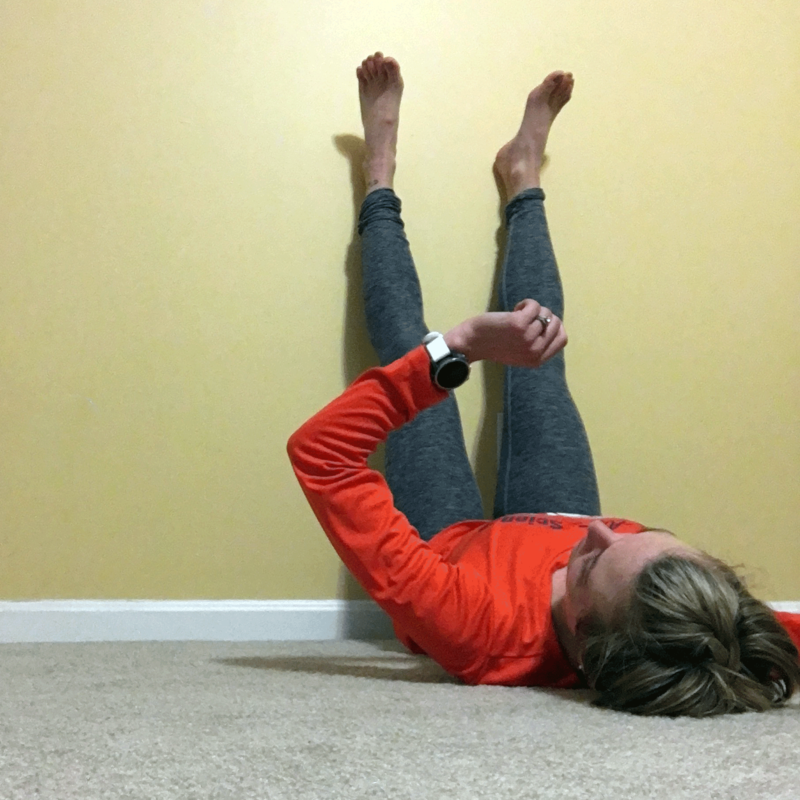 Have a favorite recovery method? Share with me on social media!